от 250 шт. — 22.70 руб. 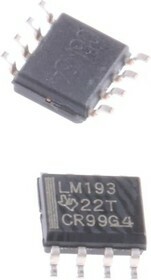 The Texas Instruments LM193, LM293, LM393 and LM2903 are dual differential input voltage comparators designed to operate from a single power supply over a wide range of voltages. The common mode input voltage range includes ground and the devices have open collector outputs.